Heritage's perception of the gridlock in Washington. The 2020 Election, Census and Redistricting are right around the corner. Get the facts to fight the most important battle we've had to fight since 1836. The Election Fraud Tour will be bringing details about mail ballot fraud, vote harvesting, the potential for digital voter fraud, etc. This is comprehensive and is the way we are building support for bills we've worked on for months to secure our Texas elections as we head into 2020. This is critical if we are going to keep Texas from falling to the hard Left in 2020. Special Event - Back by popular demand! Shulter is re-joining ET4L to provide a more detailed, step-by-step instruction of how to read, follow, analyze and look for unintended consequences in upcoming legislation. In addition to his instruction, Shulter will walk members step-by-step through an actual bill to demonstrate how to read, follow, analyze and look for unintended consequences. Following the presentation, Shulter will answer questions. Can't make it to Austin to fight or support a particular bill? You can make a difference! Join us to be part of the solution. The original 100 Club was founded in Houston in 1953 by five men who saw a need to support the families of officers killed in the course of their duties. 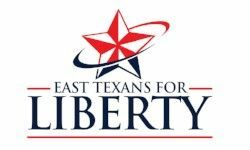 The East Texas chapter was founded in 2017 by Wayne Isbell, Chief of Mount Pleasant Police Department, and members of the East Texas Police Chiefs Association. Join us for an evening of fun and fellowship!